I've just read at WUWT how David "funny sunny" Archibald is singing the praises of an ultra-violent film (archived here). And I thought that deniers at WUWT thought the 10:10 spoof (that went nowhere) was gross (it really was). Apparently gratuitous and extreme violence, sick morals, sexism, unfunny jokes and a generally poor cinematic experience is viewed as wonderful entertainment, as long as it's disparaging anyone who cares for the environment. If you want to know what I'm talking about, read the review from the Guardian or SBS - and then some of the user reviews here on IMDB. David Archibald, the justly righteous? Instead of working against truth and beauty, Hollywood is now on the side of the justly righteous. The next stage will be when, to indicate a character’s gullibility, insanity or mental instability, it is mentioned that he once believed in global warming. The result is a prediction that the average annual temperature at Armagh over Solar Cycle 24 will be 1.4C cooler than over Solar Cycle 23. This is twice the assumed temperature rise of the 20th Century of 0.7 C, but in the opposite direction. 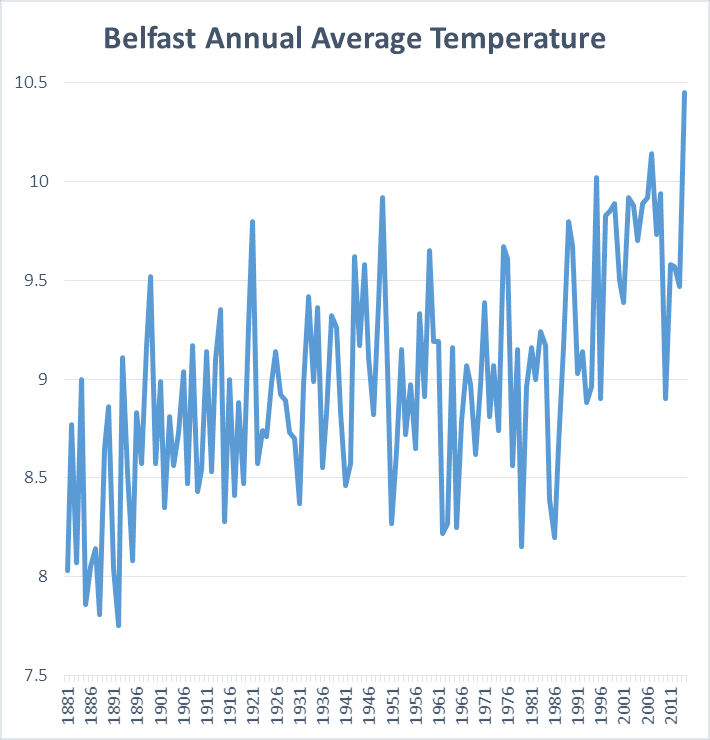 According to news reports, Northern Ireland as a whole had the third hottest year on record last year - a far cry from David's prediction of a drop of 1.4°C. DavidR pointed me to the temperature record for Armagh. I've plotted it, together with David Archibald's failed prediction. Failed is an understatement. I calculated his prediction from the average temperature over solar cycle 23 and deducted his 1.4C. I found Armagh, Quebec, but the Ireland Armagh does not seem to have recent temperature observations. I live some 50 miles away, in the ROI. Armagh does have an astronomical observatory, so maybe that is why Archibald picked it. Off topic - but I look forward to your take on the WUWT essay where a senior policy analyst for the Committee For A Constructive Tomorrow compares people the author disagrees with about climate change to terrorists. 'Cause, you know, nothing gets to a "constructive tomorrow" faster than comparing people to terrorists. Joshua are you sure you're not getting confused with Stephen Colbert's Super Pac “Americans for a Better Tomorrow, Tomorrow"? As good as Colbert is, his parodies can never match reality with "skeptics." Seriously, a group called the "Committee for a Constructive Tomorrow" uses a conspiracy theorist as a policy analyst? You asked, here it is. I hope that link works. Keep up the good work please. Thanks, DavidR. I'll check it out. DavidR, that data seems limited to just monthly mins and maxes, or am I missing something? A plot with only such data sounds like it could give an incomplete picture. This seems more comprehensive, but unfortunately not organized so as to make for easy access. Thanks, Steve. I have written about that data before, when Darko Buttina wrote some rubbish. When I went to see if I could use it for recent temps, it was much too daunting. Too much detail. The summary data doesn't include the most recent years. Right, David, and I think for present purposes the monthly is fine, but if those max/mins are single readings for the month rather than averages of all the days (the former is what it looked like to me) they could be a little off. The monthly mean temperature is calculated from the average of the mean daily maximum and mean daily minimum temperature i.e. (tmax+tmin)/2. So I think they are monthly averages, not single minima / maxima of the month. Joshua, in the tomorrow envisioned by some we'll be constructing lots more jails. EGU program is now up, BTW. Much to see! Very bad news for Willard Tony? Oh it would seem so. Although I do wonder about the impact on debunking sites since they of necessity must repeat many of the fabrications. 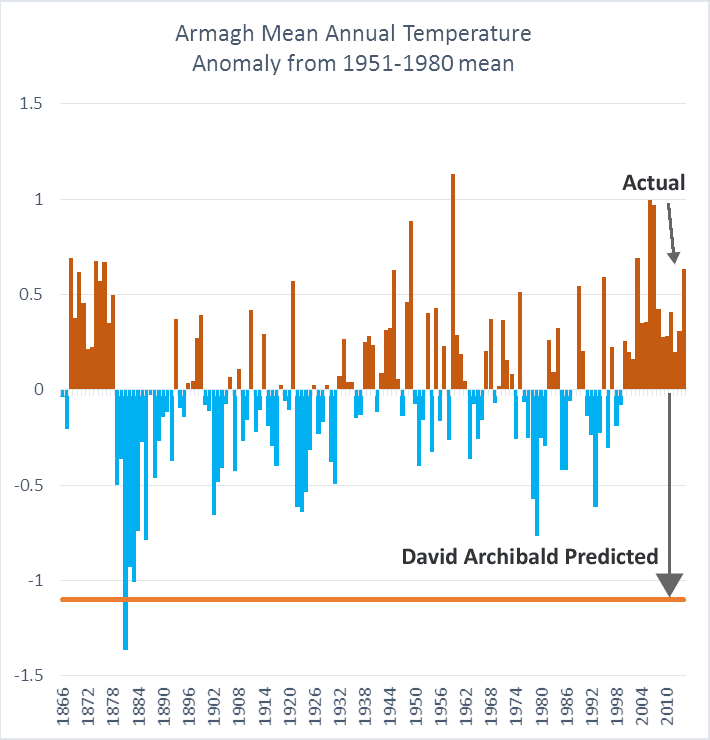 I've now added an update with the temps for Armagh plotted with David Archibald's failed prediction. I couldn't help myself and read the Archibald piece (thank God it was short). What I found particularly stupid, was that Archibald says that Hollywood has started to mock global warming. Whereas, in fact, it's enviromentalism that's being mocked. And that's nothing new. In fact, I would say this is well engrained in contemporary consumer culture. Archibald goes on to show he has a bit of an ego problem, but that's nothing new. Besides, lots of older, white men suffer from that ailment. It gets tougher thinking you're the genius/boss as you get older.